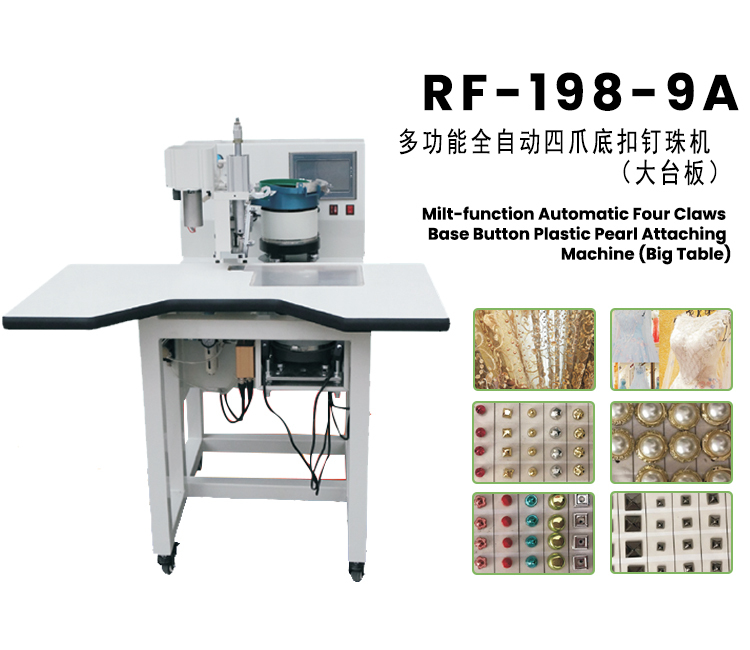 This machine is widely used in clothing, shoes and hats, luggage leather goods, belts, scarves, curtains, mosquito nets, rubber bands, handicrafts, decorations and other industries. 1. This machine is suitable for round, semi-circular, bucket shaped, conical, square plastic buckle and 4mm-16m full-round pearl. The bottom buckle is a four-claw fastening operation. Different shapes, the mold can be replaced. 2 the new design concept is suitable for multiple use of a machine, thus greatly reducing the cost. The utility model has the advantages of simple operation and beautiful effect. Is a good choice of products in various fields. 3. Adopt a new type of vibrating plate device and a more accurate mold, so that the supply of face buckle and bottom buckle is smoother. Laser positioning, pinning position is not correct. 4. The fastening of the fastener can be adjusted according to the need. 5. The touch control panel is used to adjust the speed conveniently.